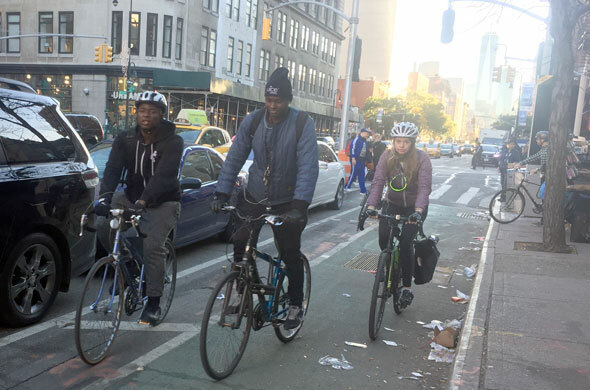 The new protected bike lane on Sixth Avenue, between 8th Street and 33rd Street, has turned one of the city’s most stress-inducing bike routes into one of its best. But north of 34th Street, Sixth Avenue has no bike lanes whatsoever. What could be a safe, direct connection to the Midtown core and Central Park instead deposits cyclists into five lanes of chaotic car traffic. We got a stark reminder of the unfinished business on Sixth Avenue yesterday morning, when the driver of a white van injured a 56-year-old woman riding a Citi Bike between 47th Street and 48th Street. The victim survived with her leg badly injured, according to witnesses. Since then, the agency has said an extension from Canal to 8th could happen in 2017. No timetable has been provided, however, for the critical stretch between 33rd and Central Park. In a statement, Transportation Alternatives Executive Director Paul Steely White said the city’s protected bike lane network isn’t expanding fast enough to keep up with the growing bike-share system. Almost 40 percent of the 613 bike-share stations are more than quarter-mile from a protected bike lane, he said. “Today’s crash reportedly occurred at an unprotected location between 47th and 48th Street, providing more evidence that we need a protected bike lane along the entire length of Sixth Avenue, just as cyclists need protection along all of New York City’s dangerous major streets,” said White.